Animal Endocrine Clinic: Is a High Serum T4 or Free T4 Level Always Diagnostic for Hyperthyroidism in Cats? Is a High Serum T4 or Free T4 Level Always Diagnostic for Hyperthyroidism in Cats? 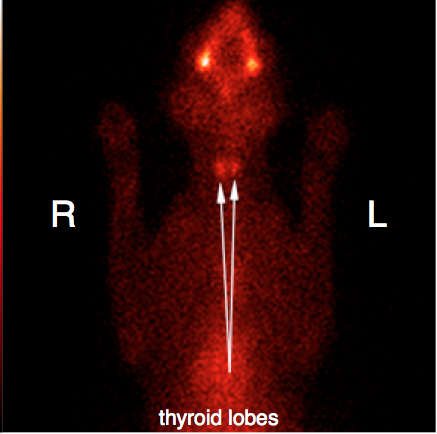 Thyroid scan (scintigraphy) in a cat suspected of hyperthyroidism. Both thyroid lobes are of normal size and shape. Uptake of the radionuclide by the thyroid is also normal, with a thyroid/salivary ratio of 0.8 (normal <1.5). This is a normal study and rules out hyperthyroidism. I've read on your blog "we almost never see false-positive results with the total T4 test." Since you say "almost," I'm wondering what, if anything, might cause a false-positive result? I have a 16-year old, male domestic long hair cat who currently has a total T4 value of 6.0 µg/dl (reference range, 0.8-4.0 µg/dl) after being off of methimazole for 5 weeks. He has a long history of chronic diarrhea associated with inflammatory bowel disease (IBD). About a year ago, we suspected hyperthyroidism based on a high-normal total T4 with a high free T4 concentration. He had thyroid scintigraphy at that time to confirm hyperthyroidism and help with his radioiodine dose calculation (we wanted to ensure that he wasn't overdosed — I don't want to end up with a hypothyroid cat!). Surprisingly, the results of this thyroid scintigraphy were negative (see his thyroid scintiscan above), though he was getting iodine supplements at the time. About 6 months ago, his serum T4 was a bit higher (and his free T4 remained high) so we started treatment with methimazole. He was on methimazole for about 6 months, which did lower his T4, but the drug seemed to significantly worsen his chronic diarrhea, and he didn't gain any weight. My veterinarian has never been able to palpate an enlarged thyroid tumor in my cat. I am interested in I-131 treatment, but would like to be as certain as possible he is hyperthyroid before making arrangements. Could there be any other explanation for high total and free T4 concentrations Do you see false-positive results? His primary veterinarian and his internist both say they know of no other explanation for high total T4 concentration other than hyperthyroidism. But when I read "almost never" on your blog, that seems to imply it's possible (though unlikely) to get a false-positive test result. Since I know that you are the expert on feline hyperthyroidism, I thought I would try asking for your advice. I don't want to pursue radioiodine treatment if he isn't truly hyperthyroid. In older cats that develop clinical signs of hyperthyroidism, confirming a diagnosis of thyroid disease is usually straightforward (1-3). However, the potential for false-negative and false-positive results exists with all thyroid function tests (4,5) — especially in the context of routine screening of asymptomatic cats or cats sick with nonthyroidal disease (such as the IBD in your cat). This can lead to clinical dilemmas and misdiagnosis. To avoid unnecessary treatment and potentially adverse effects in a euthyroid cat (i.e., normal thyroid status), thyroid function test results must always be interpreted in the light of the cat’s history, clinical signs, and other laboratory findings. All cats with hyperthyroidism have a thyroid nodule (goiter) affecting one or both thyroid lobes, since in all cases there is underlying thyroid pathology leading to the disease (e.g., thyroid adenomatous hyperplasia, adenoma or carcinoma) (6). Because all hyperthyroid cats must have at least one (if not two and sometimes more) thyroid nodules in order to develop the disease, the finding of a thyroid nodule, either by cervical palpation or by imaging (e.g., thyroid scintigraphy – see later), plays a crucial role in diagnosis in these cats (1-5). If the veterinarian cannot palpate a thyroid nodule in the cat suspected of having hyperthyroidism, diagnosis becomes much more difficult to confirm, especially in cats with mild or borderline disease or in cats with concurrent illness. A high circulating total T4 concentration is the biochemical hallmark of hyperthyroidism and is extremely specific for its diagnosis (1–5). False-positive results (i.e., a high T4 in a cat without hyperthyroidism) are relatively rare but are being seen with increasing frequency, especially with the automated T4 immunoassays and in-house testing kits. In agreement with that statement, we recently reported that 1–2% of all cats diagnosed as hyperthyroid based on the finding of a high serum T4 concentration turn out to be euthyroid based on results of thyroid scintigraphy (4,5). Therefore, if a high serum T4 value is found in a cat that lacks clinical signs of hyperthyroidism, especially if no thyroid nodule is palpated or when concurrent disease is present, one should never hesitate to repeat the serum T4 test using a different technique. In these cases, T4 measured by radioimmunoassay (RIA) or chemiluminescence (Immulite) is preferred (4,5). Alternatively, additional thyroid function testing (complete thyroid profile, thyroid scintigraphy) may also be recommended (4,5,7-10). Many veterinarians believe that determination of a serum free T4 concentration is more reliable than measuring total T4 alone, since free T4 values are more consistently elevated in hyperthyroid cats than are total T4 concentrations (3,11). Although free T4 is a more sensitive diagnostic test than total T4 for diagnosing hyperthyroidism, the test specificity for free T4 is poor, with up to 20% of sick (and some clinically normal) euthyroid cats having false-positive free T4 results (3,11-13). Caution is, therefore, advised in using serum measurements of free T4 as the sole diagnostic test for hyperthyroidism. As always, it is important to combine these thyroid test results with the cat’s clinical features and the presence of a palpable thyroid nodule to make the correct diagnosis. More important, however, is the situation in cats that maintain reference interval serum T4 values and are diagnosed as hyperthyroid on the basis of a high serum free T4 concentration. Up to 30% of these cats presenting with a mid- to high–normal total T4 value, together with high free T4 concentrations by dialysis, will turn out to be euthyroid based on results of thyroid scintigraphy (4,13). It is unclear how much additional useful information is truly gained by the use of free T4 assays over the use of total T4 estimations alone. Many veterinarians mistakenly believe that the finding of high free T4 in a cat is completely diagnostic for hyperthyroidism, especially when total T4 is within the middle to upper half of the reference interval. However, since up to a third of these cats may turn out to be euthyroid (4,13), it is clear that the free T4 test can never be considered a "gold standard" diagnostic test for thyroid disease in cats. Use of free T4 testing can lead to more confusion than clarity in some hyperthyroid cats; certainly, reliance on free T4 results risks misdiagnosis of hyperthyroidism in many euthyroid cats, especially those with non- thyroidal illness. So what is the next step if we find a high serum T4 in an asymptomatic cat in which no goiter is palpable? The first steps should always be to repeat the cervical palpation looking for a thyroid nodule and to verify the high T4 concentration. Again, the veterinarian should never hesitate to repeat the serum T4 test using a different technique, with RIA or CEIA preferred in such cats. Again, if we have any doubt about the diagnosis, thyroid scintigraphy should be considered (1,2,4,5). In many of these asymptomatic cats in which the diagnosis is unclear (e.g., borderline or only slightly high T4 concentration, no obvious thyroid nodule), the best approach is to use close observation rather than start any treatment (4,5). With this cautious approach, one should recheck the cat at 2- to 3-month intervals, and at each visit monitoring the cat’s body weight, carefully re-palpating for a thyroid nodule, and repeating the serum T4 concentration doing a complete serum thyroid panel (T4, free T4, T3 and TSH) (4,5). If the cat is truly hyperthyroid, the thyroid tumor will continue to grow, the serum T4 will eventually rise into the hyperthyroid range, and the cat will lose weight. But what's up with your cat? Is he really hyperthyroid? Well, the finding of a T4 value of 6.0 µg/dl is certainly consistent with hyperthyroidism, but I'm bothered by a number of issues with the case. First of all, his thyroid scan done a year ago was completely normal. Of course, a thyroid tumor could have developed during this period, but the clinical signs a year ago appear to be similar to those your cat is showing at this time. Secondly, medical treatment made the diarrhea worse, not better. If hyperthyroidism was responsible for your cat's gastrointestinal signs (the main problem), lowering the serum thyroid values should have helped, not made the situation worse. Thirdly, remember that all cats (as well as all humans) likely have their own individual "reference range," so it's possible that a T4 value slightly outside of the lab's reference range could actually be normal for that individual (14,15). Could it be that your cat normally runs higher thyroid hormone levels than most other cats? Or is current high T4 simply a laboratory error? That would certainly be the most common reason for the finding of a single "high" T4 concentration in a euthyroid cat. Finally, you have seen a number of veterinarians (your regular veterinarian as well as internal medicine specialists). Despite multiple exams being performed by different vets, no one has been able to palpate a thyroid nodule. If this was my cat, I would not rush into treatment without repeating the thyroid scan to document the presence of a hyperfunctioning thyroid tumor. Mooney CT, Peterson ME. Feline hyperthyroidism In: Mooney CT, Peterson ME, eds. BSAVA Manual of Canine and Feline Endocrinology. Fourth ed. Quedgeley, Gloucester: British Small Animal Veterinary Association, 2012;92-110. Baral RM, Peterson ME. Thyroid gland disorders In: Little SE, ed. The Cat: Clinical Medicine and Management. St. Louis: Elsevier Saunders, 2012;571-592. Peterson ME, Melian C, Nichols R. Measurement of serum concentrations of free thyroxine, total thyroxine, and total triiodothyronine in cats with hyperthyroidism and cats with nonthyroidal disease. J Am Vet Med Assoc 2001;218:529-536. Peterson ME. Diagnostic testing for hyperthyroidism in cats: more than just T4. J Fel Med Surg 2013;15:765-777. Peterson ME. Diagnostic testing for feline thyroid disease: Hyperthyroidism. Compend Contin Educ Vet 2013:in press. Gerber H, Peter H, Ferguson DC, et al. Etiopathology of feline toxic nodular goiter. Vet Clin North Am Small Anim Pract 1994;24:541-565. Mooney CT, Thoday JL, Nicoll JJ, et al. Qualitative and quantitative thyroid imaging in feline hyperthyroidism using technetium-99m as pertechnetate.Vet Radiol Ultrasound 1992;33:313-320. Daniel GB, Sharp DS, Nieckarz JA, et al. Quantitative thyroid scintigraphy as a predictor of serum thyroxin concentration in normal and hyperthyroid cats.Vet Radiol Ultrasound 2002;43:374-382. Broome MR. Thyroid scintigraphy in hyperthyroidism. Clin Tech Small Anim Pract 2006;21:10-16. Peterson ME, Broome MR. Thyroid scintigraphic findings in 917 cats with hyperthyroidism. J Vet Intern Med 2012;26:754. Mooney CT, Little CJ, Macrae AW. Effect of illness not associated with the thyroid gland on serum total and free thyroxine concentrations in cats. J Am Vet Med Assoc 1996;208:2004-2008. Wakeling J, Moore K, Elliott J, et al. Diagnosis of hyperthyroidism in cats with mild chronic kidney disease. J Small Anim Pract 2008;49:287-294. Peterson ME, Broome MR, Robertson JE. Accuracy of serum free thyroxine concentrations determined by a new veterinary chemiluminscent immunoassay in euthyroid and hyperthyroid cats. Proceedings of the 21st Annual European College of Veterinary Internal Medicine (ECVIM-CA) Congress; 2011. Andersen S, Bruun NH, Pedersen KM, et al. Biologic variation is important for interpretation of thyroid function tests. Thyroid 2003;13:1069-1078. Andersen S, Pedersen KM, Bruun NH, et al. Narrow individual variations in serum T(4) and T(3) in normal subjects: a clue to the understanding of subclinical thyroid disease. J Clin Endocrinol Metab 2002;87:1068-1072. I'm wondering if you can offer insight into my dog's hyperthyroidism. She is a 12-year old mini dachshund. I took her to our regular vet because she was drinking and urinating much more than usual. Otherwise she is happy and lively and eating well. Blood and urine analysis excluded diabetes and Cushing's but found T4 count of 8.6 ug/dL, more than double what it should be. Other findings were modetately elevated reticulocytes and nucleated red blood cells (22/100 ml). She is not anemic and total RBCs and WBCs are normal. My vet suspected a tumor and did a cervical x-ray and an abdominal ultrasound, neither one of which found anything remarkable. We were then sent to an oncologist who did further research on nucleated red blood cells and found moderate elevation can be seen in some mini-schnauzers and dachshunds and is considered normal. She is satisfied that the important finding is the high thyroid. She found nothing on palpitation of Hanna's neck, and did a cervical ultrasound which also showed nothing abnormal. Then she did a follow-up, more comprehensive thyroid panel which confirmed the very high thyroid. She suspects ectopic thyroid tissue may be the cause and is arranging a nuclear scan. I undetstand ectopic thyroid tissue is very rare and am wondering if anything else might account for Hannah's high T4. Smaller thyroid tumors can be difficult to palpate in dogs, and ectopic tumors (just below the tongue or in the chest) are relatively common (about 5% of the cases). I agree with the workup so far, and the plan to do thyroid scintigraphy next. That should tell us if there is a thyroid tumor and, if so, where it is located. My 13-year old cat has had significant weight loss, extremely increased appetite, agitation (mainly around feeding time), and restlessness. The first vet we saw tested his T4 and Free T4, and found them to be at the high end of the range (4.0 for T4, ref. 2.5-4.0; 50 for the free T4, top of the ref. range). She declared him not to be hyperthyroid. He has continued to lose weight, so I took him to a second vet, who re-tested him, and found again 4.0 T4 and 51 Free T4. This vet, and another one at the same practice, stated that he is definitely hyperthyroid and yesterday started him on methimazole (2.5 mg., 2x/day). Neither vet recommended that our cat undergo a thyroid scan to assess for presence of a tumor. No tumor was palpable on exam. After reading your research, I am questioning whether we actually have a definitive diagnosis for my sweet boy. I'm wondering if a thyroid scan would be the appropriate--and necessary--next step, perhaps discontinuing the methimazole until then. The clinical signs that your cat is showing are classical for hyperthyroidism, but I'd expect much higher thyroid hormone values. In my mind a T4 of 4 ug/dl is borderline, but most cats with hyperthyroidism have a free T4 much higher than 51 pmol/L. If you can't do a scan, I'd repeat the thyroid panel and also do a TSH level. You might also want to do a T3 suppression test. I've written about all of these tests on this blog so you can read about the tests here. Thank you for your quick response, Dr. Peterson. I live in Nassau County, so would I be able to come to your NYC office for an appointment? We can certainly do the thyroid scan. We do that procedure at my office in Bedford Hills, NY (Westchester county). If your cat is on methimazole, that should be stopped for 1 week (or longer is on the drug chronically, which doesn't appear to be the case here). Call Carol at 914-864-1631 for more info and to make an appointment. Hi Dr. Peterson, I have a cat who is almost 19, who had I-131 treatment in 2009 for hyperthyroidism. She had all clinical signs, drastic weight loss, increased vocalization, loss of belly and rear leg fur and a nodule on her thyroid. She was treated with methamizole for two years prior to treatment while I saved for the treatment. She responded well and was presumed cured for four years. Recently she lost 1 1/2 lbs and has started vocalizing more again. She is a former feral cat and prior to treatment was very skittish as well as being frisky. After treatment, she became less skittish which I had always assumed was just due to being feral. Last year I felt she was getting skittish again but her tT4 was normal, mid range. Because of the weight loss, I took her in for another workup and did fT4, as we have been doing since treatment. It was high normal, 4.2 (1.8-5.2), I've noticed other fT4's are double digits so am not sure why her range is different. She does not have a nodule on her neck but with the classic symptoms plus high normal fT4, I would think she is becoming hyper again although I've never heard of a cat going hyper again after four years cured. She also has a mass on her lower abdomen, weigh back between her legs. It has been there for at least 7 years and fluctuates with her weight. She also had a small mass on her tail near the base that got smaller with weight loss and larger when she gained. My vet doesnt think the mass is anything to worry about, does not think its connected to anything, but just a fatty cyst. It feels about 1 1/2" in diameter. But she is underweight now and the mass is still there. Could this be related to her thyroid? The vet at the clinic that did her treatment said thyroid tissue can be found in other areas of the body sometimes. She has no GI issues other than recent constipation. We also changed one of her dry foods and she doesn't like the other as much. She does eat canned food too but in very small amounts at a time. It's possible her weight loss is due to eating less since the food change so I will monitor her weight. Another concern is she is low potassium (3.3), along with low phosphorus and Co2, which have all gone in and out of range for years. The vet suspected respiratory alkalosis due to her extreme fear at vets, but now she doesn't think it's due to that and wants to supplement potassium, which could be bad if her potassium is only low at vets visits. Any thoughts? It doesn't sound like your cat is having a relapse of hyperthyroidism to me. Ectopic thyroid tissue can be found in the tongue or chest but that's rare; we don't ever see thyroid tissue near the abdomen. Hypokalemia and alkalosis are not related to hyperthyroidism. Something else is going on, but you and your vet are going to have to keep monitoring and doing more investigations. Thank you so much for providing so much information on hyperthyroidism in cats. Three weeks ago my cat was diagnosed with hyperthyroidism and this blog has been really helpful. My cat Bella is a 12-year old DSH and she has always been an indoor cat. Three weeks ago she was leaving clear drops of blood around the house so I took her to the vet. The cause of that turned out to be FIC and it cleared up pretty quickly after that. Because during the exam my cat was breathing very rapidly and had a high heart rate my vet asked if she could also run a test for hyperthyroidism. Two months ago Bella's litter-mate and her close buddy Rosie passed away. Around a week before I realized that Rosie was sick (abdominal cancer that had spread to her liver), Bella started waking up during the night and meowing in my bedroom. Rosie lived for another three weeks, but after Rosie's death Bella became even more distressed. She kept sitting before the front door as if she was waiting for Rosie to come back. She would also wander around the house meowing and sniffing everything. Three weeks ago that behavior had mostly stopped, but she would still sometimes wake me up during the night and definitely every morning at around 5:30 am. I would tell her to shush and then she would leave, but then I would hear her running around the house playing, jumping on all the tables and cabinets. This was another reason why my vet also suspected hyperthyroidism. Her T4 level turned out to be 55 and according to my vet it needs to be below 45. I was given 2.5 mg Methimazole tablets to give to Bella once daily. Yesterday we went to the vet for Bella's check-up. Even though she was still breathing rapidly during the exam, her heart rate was now normal. Because of that my vet suspected that the meds had been working. I was still worried, because she is still playing during the night, meowing a little bit more than she used to and waking me up early in the morning. While we were waiting for the test results my vet said that she wanted to start Bella on anti-depressants. Her test results showed that her T4 level is now at 46 and still too high. My vet scrapped the anti-depressants plan and has now subscribed Bella 5 mg Methimazole tablets to be given once daily. I’m just so worried about giving her such a high dose when her T4 level is only one point too high. Yesterday my vet also told me that with this condition she can normally feel lumps in the neck area, but with Bella she can’t feel any. Bella has always been a very vocal and active cat, so her increased meowing doesn’t feel that strange to me. She still spends most of her day sleeping. To find the cause of her bleeding they ran a lot of tests and everything came back normal. She didn't have a fever, her temperature was actually on the lower side. She hardly drinks her water. Her appetite hasn't increased and she hasn't lost any weight (she's always been 3 kg), her back does look a bit slimmer to me. Also when she's on my lap purring, she takes these deep breaths. I've counted her breathing rate at home a couple of times and she takes around twenty breaths per minute. Before starting the Methimazole her fur would also sometimes feel greasy to me. These are Bella's results from her Vetscans. Three weeks ago: T4 = 55.0 nmol/L (19-62 nmol/L), protocol.lab result.CHOL = 5.5 mmol/L (2.3-5.3 mmol/L). Yesterday: T4 = 46.0 nmol/L (19-62 nmol/L), protocol.lab result.CHOL = 5.1 mmol/L (2.3-5.3 mmol/L). I'm not sure exactly what you want me to say. Are you questioning the diagnosis? Or you are sure your cat is hyperthyroid but you are afraid to raise the methimazole dose? When we treat with methimazole, we want to T4 value to be between 1.5-2.5 ug/dl or so. Therefore, if the T4 remains this high, you must either raise the dose or do another treatment (may not be a bad idea in a 12-year old cat anyway). Talk to your vet about where to go next with your cat's diagnosis and/or treatment. I'm sorry I was unclear. I'm Dutch and sometimes it’s difficult to translate my thoughts into concise English. Yes, I was wondering about both questions. My vet only discussed one number with me, the T4 value of 46. And I thought I had read that if a cat has no nodules that you can never make the diagnosis from the T4 value alone. I wasn't sure if my vet had done sufficient testing. But I take it the 5.1 number is the one that is really too high? I've already made an appointment for Bella to see a different vet tomorrow. I had another issue with my vet which was that when I mentioned the radioactive iodine treatment she said that, that was more something you should start to look at when the meds eventually stop working. That just really confused me, because I've read so many positive things about the iodine treatment. I really want to make sure I'm treating Bella's condition in the best way possible. Thank you so much for your help and your quick response. I really appreciate it. No need to apologize. If we're not sure of the diagnosis and no thyroid tumor can be palpated, it's always good to repeat the T4 value, sometimes by another method such as RIA or chemiluninescence (Immulite method). In addition, measuring serum free T4 and TSH, in addition tothe total T4 concentration, can be very helpful. Of course, to repeat those values, you must stop the methimazole for at lest 4-5 days to get accurate results. Otherwise, they may be normal due to the effects of the drug. That would be the first step - to determine if you cat is actually suffering from hyperthyroidism or not. In some cases, we must do thyroid scintigraphy to do confirm the diagnosis, but that scan test is available both in the Netherlands and in Belgium if you do need to do it. Dr Peterson, my cat Ziggy is 12 years old. He is overweight. In September 2013, his T4 was 4.11 (1.20-5.50) On June 5, 2014, his T4 was 6.19 with the same reference range. However the specimen hemolyzed 3+. And he had gained another pound. My vet wants me to start him on methimazole. What do you suggest? I don't make a diagnosis of hyperthyroidism based on a T4 value alone, but based on the finding of a palpable thyroid tumor and other clinical features. Can your vet palpate a thyroid tumor? If not, then I would repeat the serum T4 along with a full thyroid panel (at least T4, free T4, and TSH). If both the total and free T4 come back high and the TSH is low, that would be consistent with hyperthyroidism. Without any clinical signs, treating with methimazole is questionable. This treatment does nothing to tumor growth or pathology; it just blocks T4 secretion and controls clinical signs. If that is the route you want to go (if your cat turns out to be hyperthyroid), you have some time before you HAVE to start that medicine. I'm having the same problem as the person who posted the original question. My cat has rising T4 and free T4 values, but scintigraphy revealed no adenoma. Yet she has lost another pound in the last 3 months, has lost muscle mass and is extremely bony, has a horrible coat, has a murmur and borderline BP problems, and just really looks awful. 1) What other conditions *could* cause these elevations in thyroid hormones if it's not hyperthyroidism? I can't find references to what diseases may do this. 2) Why must a cat have an adenoma in order to be classified as hyperthyroid? It seems like the existence of excessive levels of thyroid hormones is basically what it means to be hyperthyroid, just as not producing enough is the definition of hypothyroid, regardless of the organic process causing the condition. Humans have variations of hyperthyroidism, why is it so narrowly defined in cats? 3) Isn't a high T4/Free T4 level a problem regardless of the cause, as it's causing all of the same symptoms as hyperthyroidism caused by an adenoma? I'm concerned that my cat is suffering the bad symptoms of hyperthyroidism, but is not being treated because scintigraphy didn't find a tumor. No one can explain her terrible condition, or suggest another disease which could cause her thyroid hormone elevations. Considering that she also has CKD, which suppresses T4 levels, that means her T4 would probably be even higher without the CKD. Thanks for any further insights into this. Difficult to answer without seeing the scan or actually getting the DICOM file to analyze. Is the total T4 high? How was this measured? Is the FT4 high? If so, what technique was used to measure it? In cats, the T4 and FT4 go up because of toxic nodular goiter (thyroid tumor), dietary ingestion of too much thyroid hormone (rare), or laboratory error. We certainly see cats with subclinical or very mild hyperthyroidism that have borderline normal thyroid scans but these cats are not very symptomatic. If your cat has CKD, that may explain weight loss, muscle wasting, etc. If you really believe that your cat is hyperthyroid, then have your vet do a trial on methimazole to see if all of the problems go away! thank you so much for sharing your expertise and publishing these blogs. I am desperate, the vet is not of very much help, and I dont know whom else to ask, so please forgive my long writing. If there was a cat with symptoms, that could be interpreted as hyperthyroid, such as weight loss despite good appetite, slight pd/pu, fast heart rate, i.e., signs of accelerated metabolism, which also has a high T4, would that cat always benefit from controlling/lowering T4 ? My 16yrs old british shorthair girl has an outward growing neoplasia since almost 2yrs (in 2013 still mistaken as a harmless cyst), palliative care. During the last years, she lost about 2 - 3 pounds (is 6 pounds now). Sleeps more and deeper. Still eats and grooms well. Has been talkative and interested in food all her life. Drinks about 100-140 ml daily. Started to show signs of anemia (obsessive licking zinc balcony lining) some weeks ago. Bloodwork of Jan 7 showed low hematocrit (22,4%), high WBC, high BUN (only slight crea - 1,4), and high T4(out of their device's range [-8.0]). Blood sugar on hometesting ok, urine SG 1029-1026-1023-1026-1020-1025 (changing all the time), stick test (combur5) ok except leukocytes. Vet focuses on T4 and WBC - treatment option: Felimazole and antibiotics. I am more worried about the anemia and electrolytes (as of course, shes always loosing small amounts of body fluids incl. blood through the tumor), and of course, her kidney function. He insisted on putting her on Felimazole - I tried, never on empty stomach and only with half the standard dose. But after the 3rd day on 2xdaily 1,25 mg Felimazole, showing increasing signs of nausea (although still eating and drinking good), she explosively vomited a lot of clear liquid at once (like never before in her life!). After immediate drinking/eating, her stomach started to burp and blubber again, and she seemed to want to vomit, but I could calm her down. I stopped taking the Felimazole then. The burping, slight ear/face scratching and slight twitching subsided after 1 days. She has never vomited again since. Made sure, she always had food in her bowl and never needed to wait hungry, added some more fat and raw meat more often, monitored weight (remained stable), kept her away from the zinc, tried to make tumor dressing changing as atraumatic as possible (as not to induce bleeding), added some (blood) Iron and B12 to her diet to help her with blood production. Was good until last weekend, when I noticed slight hind leg weakness again, slight constipation (might also have been b/c of highly digestible raw meat). She seems to need longer to “think“. Felt her trembling last night. If I wasnt watching her so closely, maybe I wouldnt have noticed, because otherwise, she still behaves not too different. Eats, drinks, relaxes, uses the litterbox, is attentive, etc. Vet still basically only focuses on T4 treatment and antibiotics. Wants to administer Felimazole/Metimazole cutaneously now (ear gel)., b/c “the hyper T will kill her if we dont control it“. Me, I still am worried, that the anemia or possible electrolyte inbalances will do more harm more quick than the hyperT can, if we just wait it out until the thyroid meds work. Also, I am not really convinced, that the thyroid is really the reason for the high T4, and I would stress her unnecessarily. There's only 2 vet clinics in Germany that offer radio diagnostic / therapy, none of them ist near, and both do sczintigrafy only under anesthetics! Unfortunately, it seems difficult to find specialist vets here, and I dont have a car and cannot stress her too much by carting her around by public transportation for hours. Also, most clinics I know are not really staffed during the night, so I wouldnt want to leave her there (mostly unattended, in a cage, all alone, fragile and frightened!). If that was your cat, what would yo do? What would you take care of first? Would you try the ear gel? Anemia is not a sign of hyperthyroidism. So you need to address both problems, since anemia is a sign of serious illness (the presence of anemia obviously is not a diagnosis and I can't tell you what the cause is.. kidney disease is most common). Hello Dr. Peterson. My 14.5 year old cat Spike was recently diagnosed with hyperthyroidism. He hasn't shown any major clinical signs except for a slight decrease in appetite and an increase in thirst. He's not vocal, not ravenous, hasn't lost any weight. He's at 64 nmol/L. I decided to go with the transdermal gel instead of pills. I just picked up the prescription and my vet is prescribing 0.1ml twice a day, the equivalent of 2.5mg twice a day. I am wondering if this might be too high since his values are still very borderline? I would appreciate your opinion. Thank you.